Uma Thurman & Daughter Maya Hawke Have Night Out at Williamstown Theatre Gala! 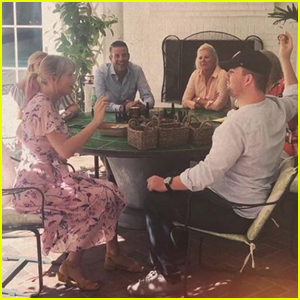 Some fun mommy-daughter bonding time! 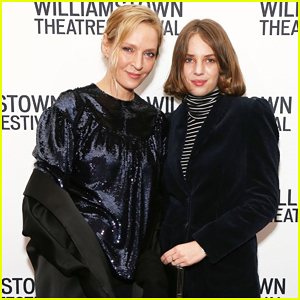 Uma Thurman was accompanied by her 20-year-old daughter Maya Hawke at the 2019 Williamstown Theatre Festival Gala held at the 583 Park Avenue party space on Monday (February 11) in New York City. 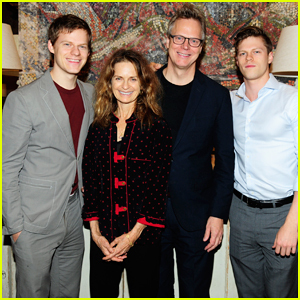 Uma and Maya were also joined at the event by Audra McDonald, Omar Metwally, Becky Ann Baker and her husband Dylan Baker. Uma is set to step onto the Main Stage in a new translation of Ibsen’s Ghosts from Paul Walsh, according to Playbill. Carey Perloff will direct the staging, running July 31 through August 18. 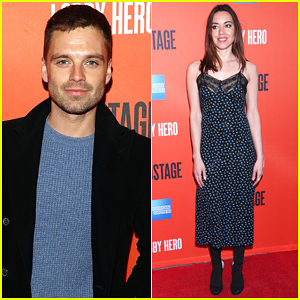 Sebastian Stan & Aubrey Plaza Support Chris Evans & Michael Cera at 'Lobby Hero' Opening Night! Sebastian Stan keeps it cool as he brings his handsome face to the Broadway opening night after party for Lobby Hero held at the Hayes Theater on Monday (March 26) in New York City. 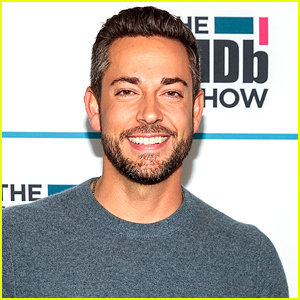 The 35-year-old actor was joined at the event by Aubrey Plaza, Tony Goldwyn, Aaron Tveit, Sam Rockwell, Annette Bening, Daniel J. Watts, Tavi Gevinson, Jorma Taccone and his wife Marielle Heller, Dylan Baker and his wife Becky Ann Baker, and Luann de Lesseps. 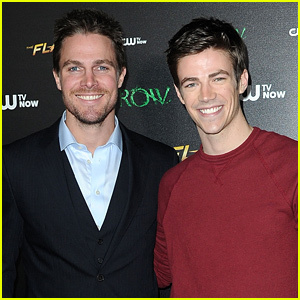 Chris was in attendance to support his Avengers: Infinity War co-star Chris Evans while Aubrey showed her support for Michael Cera, who she starred with in Scott Pilgrim vs. the World. FYI: Aubrey is wearing a Michael Kors Collection slip dress and EF Collection rings. Kerry Washington Surprises Fans For Neutrogena's New Foundation Shades! 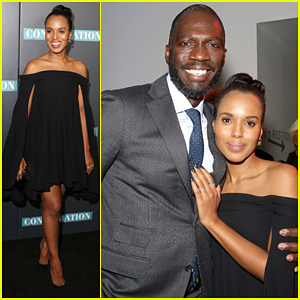 Kerry Washington is all smiles while hitting the carpet at a special screening of her HBO film Confirmation held at the Signature Theater on Thursday (April 7) in New York City. 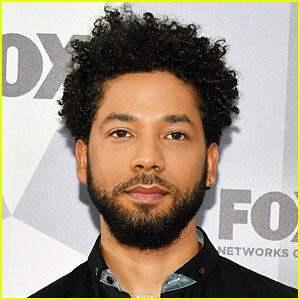 The 39-year-old actress was joined at the event by her co-star Wendell Pierce, director Rick Famuyiwa, as well as Kendrick Sampson, Jeremie Harris, Dylan Baker, Bill Irwin and Spike Lee, who all came out to show their support. 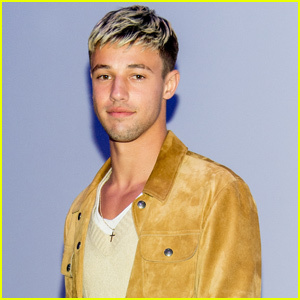 Kerry recently teamed up with Neutrogena to surprise fans with a FaceTime call to talk about their Healthy Skin Liquid Makeup shades for more skin tones and ethnicities – Watch below! FYI: Kerry is wearing a Brandon Maxwell dress paired with Gianvito Rossi shoes. 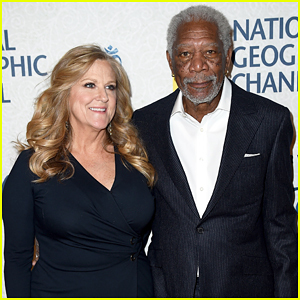 Morgan Freeman flashes a smile alongside fellow executive producer Lori McCreary while attending the world premiere of his new mini-series The Story Of God held at Jazz at Lincoln Center on Monday (March 21) in New York City. 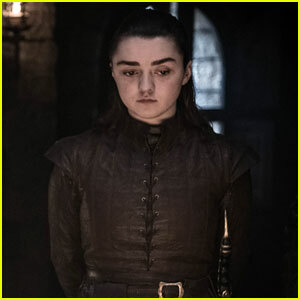 The 78-year-old actor was joined at the event by Patina Miller, Eric West, Erich Bergen, Bebe Neuwirth, Dylan Baker and his wife Becky Ann Baker. The six-episode National Geographic Channel series follows Morgan as he goes on a worldwide quest to understand faith and religion – Watch the first five minutes below! David Oyelowo stands front and center while standing alongside the cast of his movie Selma at the New York Public Library on Sunday evening (December 14) in New York City. 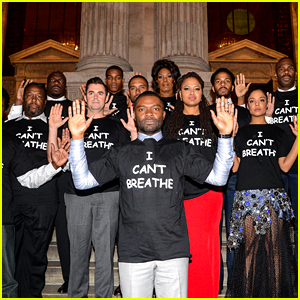 The stars wore “I Can’t Breathe” shirts to protest the death of Eric Garner, who was strangled by a NYPD cop earlier this year. Also in attendance at the premiere were stars Oprah Winfrey, Carmen Ejogo, Tessa Thompson, Alessandro Nivola, Cuba Gooding Jr, Dylan Baker, Niecy Nash, Common, and Oprah‘s friend Gayle King, as well as director Ava DuVernay. “Thankfully, we’re seeing a lot of the same good sides of protests happening with these protests – i.e. that they are nonviolent, and that we are now seeing black and white and everything in between coming together against injustice,” David told THR about what today’s protestors can learn from the movie. FYI: Carmen is wearing a Vivienne Westwood dress. Tessa is wearing a Rodarte dress, Christian Louboutin shoes, and Sha Nazarian of DiamondDNY jewelry.